Use our new what-you-see-is-what-you-get editor to craft and present your writing just as you want. Italic, tab and white-space preservation for indented layouts – your choice. Features include auto-save, edit undo-redo, preview, and pdf or hard-copy printing. Have a play around with the buttons to see what they do, and check out the Tips section below. It may be that you yearn for the old school Ad Hoc experience, or perhaps the editor doesn't work on your particular mobile device. Either way, not to worry. Here's a button to make things how they were. Whichever way you go, you'll still enjoy the same chance of winning. Which brings us to the business at hand. Your fiction must have a title; put it in the 'Title' box. The body of your work must be 150 words or less and use this week's prompt word. Using ALL BLOCK CAPITALS for your title or author name means rejection, so don't do it. After that, the formatting is up to you. Use Tab to indent without a line space like this, or block with a line space like this. But don't be afraid to experiment, as long as it works. Using the WYSIYWYG editor means all white space persists when your piece is published. Which is great, as long as no hidden stray 'spaces' have sneaked into the body of your fiction. Use edit » select all to highlight them for deletion. This one's even sneakier, and won't show up using select all. You need to move your cursor down to the very end of whatever you've put in the body. If your cursor isn't happily blinking next to the very last word of your fiction, then you've got trailing white space. Delete it. Best to steer clear as it can lead to all manner of formatting problems. Either write your work straight into the editor and format it there, or if you do want to paste from .docx or .odt, use the Classic Submission Form. What you write here may be published and put to a public vote. Not all submissions are published. If your fiction is not published, try again next round. And by the way, the little grey buttons top and bottom right will hide this introduction. Enjoy. Triple tap on the 'Validate Fiction' button to ensure your submission. If there's anything other than a blue word count in this box, your work will not submit. While in competition, your name is published under our list of contributors. Should you win, or if we create an anthology at some future point, your name and social media contact information will be published with your piece. You can use a pen name or alias if you wish. Social media contact information is optional. We never publish this. We only use your email to send you your prize if you win. You are 16 or over. Your piece doesn't breach anyone's copyright. You only make one entry per round. 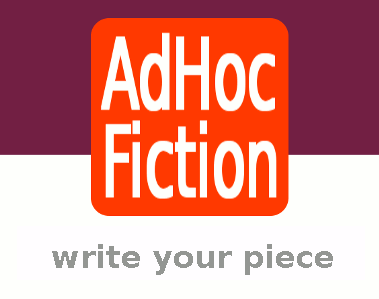 Ad Hoc Fiction can publish your piece royalty free. Ad Hoc Fiction's decisions are final. After pressing 'Send', wait a few seconds for your acknowledgement to appear here. Please be patient, at busy times your entry may be in a queue. You'll also receive email confirmation of your entry. Write or copy/paste your fiction in the boxes below. Your piece must have a title; put it in the 'Title' box. The body of your work must use our prompt word and be 150 words or less. The 'Word Count' is done for you as you write. Bold, italic and underline won't render, so don't use them. Using ALL BLOCK CAPITALS for your title or author name means rejection, so don't do it. After that, the formatting is up to you. If you want paragraph or speech tab indents, write your fiction as a .docx or .odt first. Copy/paste your work into the box and tab indents will be preserved. When it comes to document applications, we enjoy using Libre Office for free. ALWAYS click on 'Refresh Count' just BEFORE you SUBMIT. If you don't your work may be lost. After pressing 'Send', please wait a few seconds for this page to re-direct to a success message. Enter our free weekly flash fiction competition for a chance at winning a £1000 prize. You write fiction in 150 words, we publish a long list of your work, and a public vote decides our winner. Your piece must include the prompt word. Expect this to close on the 1st May 2019 BST. When we close, that’s when your fictions are published and public voting begins. That’s also when submissions open for the next Ad Hoc round, and our last round winner is announced. Note This round will last two weeks.